Reduce the fat with this made-over Zesty Pasta Salad recipe. 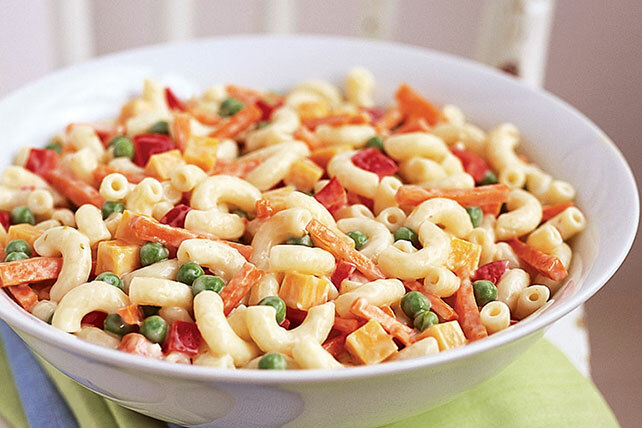 There's so much flavor packed into our Zesty Pasta Salad, you may find yourself in disbelief. We kept all of the flavor and creaminess of a traditional pasta salad in this tasty version that's prepared with KRAFT Lite Zesty Italian Dressing and KRAFT 2% Milk Shredded Colby & Monterey Jack Cheeses. We also substituted MIRACLE WHIP Light Dressing for the mayonnaise, and used a reduced amount. As a result of these simple substitutions, this makeover saves 160 calories and 21g of fat, including 4.5g of sat fat, per serving when compared to that of the traditional salad. Add 1/2 tsp. of your favorite dried herb, such as dill or basil. Prepare using KRAFT Natural 2% Milk Colby & Monterey Jack Cheese Crumbles. This flavorful salad can be refrigerated up to 24 hours before serving.